In November, Optimum released the 1-sheet for the film. Now they have released a new quad poster and a clip. 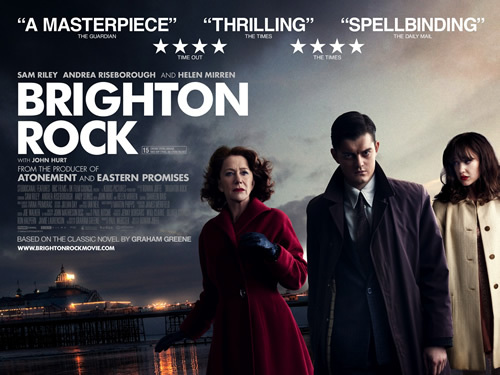 BRIGHTON ROCK charts the headlong fall of Pinkie, a razor-wielding disadvantaged teenager hell bent on clawing his way up through the ranks of organized crime. At the heart of the story is the anti-hero Pinkie’s relationship with Rose - an apparently innocent young waitress who stumbles on evidence linking Pinkie and his gang to a revenge killing that Pinkie commits. After the murder, Pinkie seduces Rose, first in an effort to find out how much she knows and latterly to ensure she will not talk to the police. A love story between a murderer and a witness; can Pinkie trust Rose or should he kill her before she talks to the police? Can Rose trust Pinkie or is she next in line? UPDATE: Optimum has requested that all, old, versions of the poster replaced with the new one.